LEXINGTON, OHIO (July 1, 2018) – It was a crazy weekend that started off with a bang announcing a new sponsor for Dakota Dickerson. And what a great way to take care of the sponsors than by giving Stress Engineering Services a “win”. 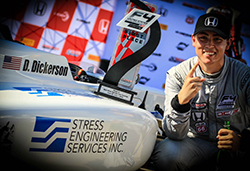 Despite many trips to the podium so far this season, this was Dickerson’s first victory in Saturday’s Round 7 of the F4US Championship Powered by Honda. On Sunday morning, Dickerson started on pole for Round 8, but after a fierce battle with the #6 car of Christian Rasmussen, he lost the lead to the Danish driver, and finished 2nd. Another podium and another great run with a well-prepared car by his DCAutosport team. In Round 9, Dickerson drove another solid race. As soon as the green flag flew, he had a great start and went from second to first place. The San Diego native was on fire as he drove his #9 Honda machine around the 12-turn 2.25-mile track until Lap 5, when Christian Rasmussen took the lead from him. A few laps later, after a short full-course yellow, on the re-start, Dickerson was hit off track by a competitor and caused his #9 car to be airborne off track. Needless to say, Dakota went from 2nd to 5th. He managed to keep his position after another full course yellow and ended the race in 5th place. A disappointing way to end the weekend, however, the goal to collect more points was successfully achieved, and championships are won on points. Be sure to catch Dakota Dickerson in action at the next F4US Championship’s official race on August 2-5 2018 at the Pittsburgh International Race Complex. Dakota Dickerson is a third generation racer from San Diego, CA. The 21 year old has been racing since he was 6 years old and is currently racing with DC Autosport in the F4 US Championship. In his first two years of racing cars he won a Driver Development scholarship from Bryan Herta Autosport (2 time Indianapolis 500 winning team), a Karts to Cars scholarship from Skip Barber Racing School, was chosen to be one of two drivers to represent the United States overseas via the Team USA Scholarship and was the 2016 USF2000 Mazda Scholarship Driver. With this success, he hopes to continue on to the Verizon INDYCAR Series. SCCA Pro Racing is a division of the Sports Car Club of America, Inc. — a 65,000-member organization dedicated to motorsports. SCCA Pro Racing provides full-service organization, operation and sanctioning for numerous professional racing series such as Trans Am® and Formula E.
FIA F4 is designed as entry-level open-wheel racing for participants, around a contemporary, modern, cost conscious formula. SCCA Pro Racing and its chosen partners embrace these ideals and support this vision through advanced technology and products. The selected F4 power plant is a production-based engine powering the Honda Civic® Type R® recently launched in Europe, tuned to meet FIA-mandated output of approximately 160 hp. The engine and the ECU are sealed to provide parity and compliance. The Ligier JS F4 carbon fiber chassis, the Pirelli Tires and Honda engine are assembled in Denver, North Carolina by Onroak Automotive North America.